"These are primitive beginnings in art, such as one usually finds in ethnographic collections, or at home in the nursery. Do not laugh, reader! Children also have artistic ability and there is virtue in their having it! . . . Parallel phenomena are provided by the works of the mentally diseased; neither childish behavior nor madness are insulting words here, as they commonly are. All this is to be taken seriously, more seriously than all the public galleries when it comes to reforming today's art." Driven by an unflinching creative intensity combined with a talent for rousing humanity's deepest desires and fears, Outsider Artists present a visionary interweave of the fabric of life. As a way to categorize the artwork that he loved made by introverted, isolated, and exceptionally imaginative characters, the French artist Jean Dubuffet coined the term Art Brut, or "raw art"; also known as Outsider Art, this latter term provides the most succinct way to reference the artist within the movement. Although Dubuffet's own art sought to imitate freedom from societal constraints - both in subject and in technique - in the same way as the art that he admired and collected - his position and status within the art world makes him far from an Outsider Artist. In many ways, founding a movement in this case is the very antithesis to the art gathered within it. However, the grouping he championed does help to direct attention onto a body of art made by people who have no interest in self-aggrandizement or self-promotion. Outsider Artists usually experience some sort of revelatory moment, akin to a religious calling when they become "artists". They typically have no formal training within an art institution and exhibit in their work a sense of heightened connectivity within the intricate system of universal balance. Without having necessarily experienced tragedy, these artists hold within an acute awareness of the forces of darkness as well as those of light. The Outsider Artist deals incessantly with a war in mind (which is often mistakenly labeled as mental illness), always navigating emotional conflict in order to create outwards paths to find inner peace. The closest more conventional movement comparable is Surrealism, as the premise of the latter is also based on the power of the human unconscious. Indeed, as well as Dubuffet, other famous artists, including Picasso, heralded this work as inspirational. The Outsider Artist however does not feel the same impetus to share and disseminate ideas, often they only ask, humbly and without expectation, to be left quiet and uninterrupted to make art. As they were coined by theorists thinking in particular about the usefulness of the terms in relation to art and artists, the definitions Art Brut and Outsider Art are used in this article interchangeably. The term, Outsider Art, was introduced in 1972 (eight years after Art Brut) by the English academic, Rodger Cardinal, and like Dubuffet he intended to shine a light on art made by artists usually untrained, living quietly, and possibly somehow sheltered. Related terms that are also introduced here, such as Folk Art, Naïve Art, and Neuve Invention, have some more specific characteristics and will not be used generally. Primitivist Art will be avoided, as this is bound to problematic social and ethnological dimensions. Outsider Artists almost always employ techniques of pattern, and obsessive repetitive design features. There is an attempt to create simple and satisfying order when they themselves are typically touched by an awareness of chaos. The repetitive mark making also reveals a profound understanding of the passage of time, of the continuum of a cycle, and the eternal linkage between past, present, and future. The tendency towards the repetitive is highlighted not only in endless similar marks made in drawings, but also through the acts of sewing, knotting, and binding. Within Art Brut we discover a rare understanding of the key paradox that resides at the heart of being human; that is, that as individuals we are at once nothing and everything (one tiny fleck in a vast cosmos, and also with only one point of reference). Through the ongoing use of portraiture within this movement, Outsider Artists expose an effortless personal knowledge of philosophical connectivity that most people must study at length and even then do not really grasp the concept. Materials used by Outsider Artists are not necessarily art materials. It is rare for artists categorized in this way to make straightforward oil paintings or sculptures from bronze or clay. More typically, and thus showing an unusual and robust resourcefulness, "outsiders" use whatever they can get their hands on, be it mud, blood, crayons, or a simple ink pen. This immediacy of material exposes the intense need to create, and furthermore illustrates that the works made are very much extensions of an ongoing reflective selfhood, rather than separate art works. Religion and spirituality play a huge part in the oeuvres of most Outsider Artists. Whilst Madge Gill signed her works with the name of her spiritual medium rather than with her own, it is often the case that artists working in this realm incorporate biblical quotations, ancient hieroglyphs, and indeed their very own languages into the work that they produce. The result is clarification that such art really does provide insight to another world, to a dimension beyond reality from which there is much to learn. There is a big question, perhaps even a problem, as to who should be termed an Outsider Artist, especially because many artists work very close to the edge of this definition; Niki de Saint Phalle, Hilma af Klint, Yayoi Kusama, and Joseph Cornell (with Kusama and Cornell interestingly having had a relationship) are all good examples. It seems that extreme rawness in art, and thus true Art Brut, can never become part of a convention, even if that convention starts to promote unconventionality. The artists mentioned above perhaps have the ability to shift in and out of the art world according to situation and need, whilst for an outsider this capacity to adapt is more painful and sometimes impossible. The first noted case of interest by artists in the art of the mentally ill is traced back to the Der Blaue Reiter (The Blue Rider) group who were active in Germany from 1911 to 1914. Wassily Kandinsky, Franz Marc, August Macke, Alexej von Jawlensky, Marianne von Werefkin, Gabriele Münter, Lyonel Feininger, and Albert Bloch, believed in the expression of spiritual values through color and form. In this quest, these artists were interested in the linkages between music and painting, as well as the concept of synaesthesia, whereby the stimulation of one sense can cause an involuntary reaction in one or more other senses. In 1912, the group published their Almanac, Der Blaue Reiter Almanach, which included theoretical essays by Kandinsky and Marc, as well as over 140 reproductions of artworks, the majority of which were classified as "primitive" art, folk art, children's art, and art of the mentally ill. In this way, they demonstrated their belief that the traditional Western Art Historical canon was suffering a particular lack that could be remedied by turning to sources outside of its purview. After a traumatic childhood, Adolf Wölfli was arrested in 1890 for the attempted sexual assault of two young girls and sentenced to two years in the St. Johannsen prison in Berne. In 1895 he was arrested once again for the attempted molestation of a very young girl. At this point he was committed to the Waldau Mental Asylum for evaluation, and diagnosed as schizophrenic. He would remain a "patient" there until his death in 1930. During his institutionalization, he was reportedly often violent and uncontrollable, and was frequently placed in solitary confinement. Some years after his admission to the Asylum, in 1908, he began to draw. At first he was allowed only one pencil per week, which he always quickly wore down to a nub. However, staff soon realized that drawing and writing helped to subdue his temper, and so they provided him with more supplies. Wölfli soon began work on his 25,000-page illustrated narrative life story which, upon his death, measured six feet high when stacked up. In this work, he constructed a new history of his childhood and a described a glorious future with its own uniquely personal mythology. The first book of Wölfli's imaginary autobiography, comprised of 3000 pages, is titled From the Cradle to the Grave (1908-1912). The image pictured here comes from this first book, in which Wölfli re-narrates his tragic childhood into a magnificent travelog, which recounts how a child named Doufi traveled "more or less around the entire world." The narrative is ornately and densely illustrated with intricate drawings of geometric shapes, fictitious maps, portraits, palaces, churches, kings, queens, animals, and speaking plants, and also incorporates text and musical notation. In the second book, titled the Geographic and Algebraic Books (1912-1917), Wölfli describes how to build in the future "Saint Adolf-Giant-Creation", a huge "capital fortune" that will allow for the purchase, renaming and urbanization of the planet, and eventually the entire universe. In this narrative, Wölfli renames himself St. Adolf II. The third and fourth books, Books with Songs and Dances (1917-1922) and Album Books with Dances and Marches (1924-1928), celebrate his "Saint Adolf-Giant-Creation" not only through drawings, but also sound poetry, songs, musical scales, and collages. Finally, from 1928 until his death in 1930, he worked on the fifth and final book, the Funeral March. In this substantial volume, totaling over 8,000 pages, he (as the website www.AdolfWoelfli.ch writes, with information collated by the Museum of Fine Art in Bern, Switzerland) "recapitulates central motifs of his world system in the reduced form of keywords and collages, weaving them into a infinite tapestry of sounds and pictures", creating "a fascinating requiem." This architectural project serves as an example of a "Visionary Environment", in which an Outsider Artist constructs a large-scale architectural or landscape site. Set in a lush garden, Cheval's Palais draws architectural inspiration from an eclectic variety of sources. Architectural authors Ulrich Conrad and Hans Sperlich described the Palais Idéal as "half pagoda, half robber-baron's castle, half nymphaeum, half tomb; not Baroque, not Hellenistic, not Buddhist, not Indian, and yet all of them at once." The Palais also includes grottos, waterfalls, subterranean chambers, and soaring towers. It even bears sculptural elements representing a variety of animals such as octopi, caiman, elephants, bears, and birds, as well as mythological creatures such as giants and fairies. One of the Palais walls bears the inscription "I was not a builder, I had never handled a mason's trowel, I was not a sculptor. The chisel was unknown to me; not to mention architecture, a field of which I remained totally ignorant... Everything you can see, passer-by, is the work of one peasant, who, out of a dream, created the queen of the world..."
Cheval was a French postman with little formal education who set forth on his project in April of 1879 despite having no experience in architecture or engineering. He later recounted how "I was walking very fast when my foot caught on something that sent me stumbling a few meters away, I wanted to know the cause. In a dream I had built a palace, a castle or caves, I cannot express it well... I told no one about it for fear of being ridiculed and I felt ridiculous myself. Then fifteen years later, when I had almost forgotten my dream, when I wasn't thinking of it at all, my foot reminded me of it. My foot tripped on a stone that almost made me fall. I wanted to know what it was... It was a stone of such a strange shape that I put it in my pocket to admire it at my ease. The next day, I went back to the same place. I found more stones, even more beautiful, I gathered them together on the spot and was overcome with delight... It's a sandstone shaped by water and hardened by the power of time. It becomes as hard as pebbles. It represents a sculpture so strange that it is impossible for man to imitate; it represents any kind of animal, any kind of caricature. I said to myself: since Nature is willing to do the sculpture, I will do the masonry and the architecture". For the next thirty-three years he collected stones that he found on his daily 18-mile mail route and took them home to add to the project, often working at night with the light of an oil lamp. At first he put the stones in his pockets, but he later began using a basket and eventually a wheelbarrow. It took him twenty years just to complete the outer walls. He carried out the entire project without any assistance. Cheval wished to be buried in his Palais, but French law forbade it. He thus spent the final eight years of his life constructing his own mausoleum at the Hauterives cemetery. The mausoleum was constructed using similar materials and style to the Palais Idéal. Toward the end of Cheval's life, artists such as André Breton, Pablo Picasso, and Max Ernst developed an interest in his Palais. Ernst even created a collage titled The Postman Cheval in 1932. In 1969, Minister of Culture, André Malraux, declared the Palais a cultural landmark and granted it official protection. In 1986 Cheval and his magical ingenuity was commemorated on a French postage stamp. Séraphine Louis, born in 1864, and also known as Séraphine de Senlis (the French town where she lived and worked) was a prolific painter of large and luscious floral arrangements. Sometimes she painted what appears to be a conventional bouquet or a typical still-life, but more often than not her images are surreal hybrids between trees and flowering bushes. Séraphine added ripe fruits to her dreamlike foliage, and created heavily patterned, sometimes even dotted leaves that begin to look more like feathers. There is no botanical accuracy to the project; it is a frenzied attempt to show something of life's beauty. Indeed, as a visionary, Séraphine suffered from mental health instability and took solace in her religious faith saying that it was often stained glass windows that had inspired her paintings. Interestingly, although the artist used oil paints, her pictures are unusually waxy in appearance and experts cannot be sure what other ingredients she added to the mix. Her work was discovered by a German art collector called Wilhelm Uhde, who whilst visiting the small town of Senlis saw one of Séraphine's paintings hanging in his friend's home; his friend told him that the picture had been painted by his cleaner. Uhde immediately befriended Séraphine, encouraged her to work large-scale, and quickly included her work in a selection of group exhibitions. Sadly, the artist did not get a chance to experience her success as she was permanently institutionalized from 1932 onwards. In this particular asylum Séraphine had no access to art materials or any outlet for her creativity. Forestier's sculptures of beasts were likely inspired by the legend of the Beast of Gévaudan, a large man-eating wolf-dog that terrorized the former province of Gévaudan in south-central France between 1764 and 1767. Forestier's beasts are frightful, baring their real teeth. In particular, Untitled appears as if it could be a trophy head of the actual beast, with its patchy pelt of leather and furs and the large horn protruding from its snout. Forestier, like many Outsider Artists who lived in institutions, was resourceful in his use of found materials. For instance, the teeth used in this sculpture were pigs' and horses' teeth, which he scavenged from the on-site farm at the hospital to which he was committed. Auguste Forestier was born on a farm in Southern France in 1887. He was fascinated with trains from a young age and frequently stole away on trains for long journeys, only to be returned to his family by the police. In May 1914, when he was 27, his curiosity led him to place some pebbles on train tracks, which caused the next passing train to derail. Upon his arrest, he stated simply "I wanted to see how the stones got crushed, and it didn't occur to me that I could derail the train". He was then placed in the St. Alban psychiatric hospital in Lozère, where he remained for 44 years until his death in 1958. While hospitalized, he began to draw portrait busts and medallions, and later began carving wooden toys for hospital employees' children. According to art historian Jenifer P. Borum, Forestier's work "became increasingly complex, as the artist went to greater lengths to shape and adorn his imaginary boats, winged creatures, and decorated generals with cloth, buttons, string, tape, leather, and even the bones and teeth from pigs or horses retrieved from the trash. Each one of his finished creations vibrates with a life of its own." At the time of Forestier's incarceration, the hospital was being run by Maxime Dubuisson, a physician who took an interest in the artistic work produced by the patients and eventually put together two volumes of drawings, many of which were by Forestier. According to curator Savine Faupin, "Forestier's wanderlust was unbroken: he ran away a total of five times between 1914 and 1923, yet he gradually began substituting his real travels with other forms of departure. His drawings and sculptures took him on fictitious journeys through history [...] Because he no longer ventured outside the hospital walls, Forestier, the stationary traveler, invented imaginary means of travel. Although he never saw the sea, he devised ships and set them to sail on the roads of Lozère by selling and trading them." Similarly, psychiatrist Jean Oury, who worked at Saint-Alban from 1947 to 1949, commented about Forestier that "This transformation from a nomad into a sedentary man can only be the logical result of the transformation of a traveler into a producer. But Forestier's work will always bear traces of the ideal of the traveler." Scottie Wilson was born in Glasgow in 1888. He enlisted with the Scottish Rifles and fought in The Great War. Afterwards he changed his name (his given name was Louis Freeman) and emigrated to Toronto in Canada where he opened a second-hand shop. At age 44 Wilson started to doodle on his counter top with one of the used fountain pens that was for sale. He had an epiphany and said of the experience, "I'm listening to classical music one day - Mendelssohn - when all of a sudden I dipped the bulldog pen into a bottle of ink and started drawing - doodling I suppose you'd call it - on the cardboard tabletop. I don't know why. I just did. In a couple of days - I worked almost ceaselessly - the whole of the tabletop was covered with little faces and designs. The pen seemed to make me draw, and the images, the faces and designs just flowed out. I couldn't stop - I've never stopped since that day." Wilson received recognition relatively quickly and by 1945 he had decided to return to London. During the early 1950s, Jean Dubuffet became aware of Wilson's work and the two met in Paris, along with Pablo Picasso. 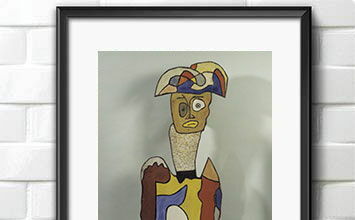 Both Dubuffet and Picasso loved Wilson's work and squabbled over who would buy which piece. Wilson was resolutely and unwaveringly uncommercial, for although he did show his work in London galleries, he typically sold his work to friends, acquaintances, and people on the street for a fraction of the price that the gallery suggested he asked for the pieces. Wilson's style is typically repetitive and often symmetrical. He completed intricate scenes using hundreds and thousands of strokes and lots of cross-hatching. He had a love for fish and birds, for totem type arrangements, and for portraits, all of which often reoccurred. As in the above image, he made many mask-like images, where countless faces can be found within one larger visage. The faces unite many cultural flavors - Indian, Celtic, and North American - and sit fittingly at the time when many artists, including Picasso, were exploring the art and objects of other indigenous peoples. Madge Gill is a relatively new and wonderful discovery to be added to the remarkable canon of Outsider Artists. Gill was born in 1882 in East London and suffered a miserable childhood because she was illegitimate. At age 9, her mother placed her daughter in the care of St. Barnardo's orphanage because of the prejudice and stigma that she continually encountered haven given birth to a child out of wedlock. When Gill was only fourteen years old she was transported across the Atlantic on a boat bound for Canada as part of large-scale child-labor scheme. She worked as a domestic servant and lived in poor conditions, but by age eighteen had saved enough money to buy her passage back to England. Living once again in London she trained as a nurse and married her cousin, Tom Gill. The union was not a particularly happy one but the couple had four children together. Two of the children survived to adulthood, but tragically, one was lost as a baby to the influenza pandemic of 1918, and the last of the four children, and the only girl, was stillborn. It was after the culmination of such great loss, tragedy, and hardship that Gill finally started to draw. She was 37 years old at the time and experienced starting her artistic practice as a sort of spiritual revelation. Gill had already shown interest in spiritualism and mediumistic practice, as shared by her Aunt Kate, but by 1919 this had developed into the dramatic and all embracing experience of being 'possessed' by a companion spirit guide called 'Myrninerest'. Gill experienced trace states and moments of ecstasy from this point onwards and did not stop making art, be it in the form of drawing, weaving, knitting, or writing, until her death at age 79. Her images typically depict many faces of women and one asks the question as to who are these figures? Does Gill make repeated self-portraits, or does she reveal to us the face of 'Myrninerest'? The images also contain celestial and geometric shapes likely related to Gill's love of astrology and astronomy, as well as to the spiritual predictions that she would make following the outcome of many séances held at her home. This sculptural painting, representing a human figure comprised of puzzle piece-like segments of bold, flat colors, stands just over six feet tall. The artist, Gaston Chaissac, serves as an example of an artist that Dubuffet originally categorized as Art Brut, due to his being an autodidact, untrained in the formal art world, but then later recategorized as a "Neuve Invention" artist, as he had greater awareness of and interaction with the mainstream art world than other artists that Dubuffet considered as more "purely" Art Brut. Chaissac was born to shopkeeper parents and raised in Avallon, France. In the 1920s, he and his sister took drawing lessons from a woman named Mademoiselle Guignepied, who also happened to teach Jean Dubuffet (although the two would not meet for another twenty years). In the 1930s, Chaissac lived in Paris where he befriended his next-door neighbors, German abstract painters Otto Freundlich and Jeanne Kosnick-Kloss. Freundlich and Kosnick-Kloss introduced Chaissac to the Modern art of the time, and supported/promoted his painting career. Their influence can be seen in Chaissac's use of distinct segments of a single flat color, although Chaissac's paintings differ from theirs in his use of thick black outlines between colored segments. The influence of Picasso and other Cubists can also be seen in the way that Chaissac experimented with various perspectives when depicting his figures. This sculptural work features an abstracted human form whose body has been segmented with strong black lines. Some of the segments are white, while others have been painted solid red or blue, or striped red or blue. The work was produced by Dubuffet during his Hourloupe cycle which lasted from 1972-1974, during which he wished to give a sculptural or "architectural" dimension to his paintings. It is evident from this, and other works, that Dubuffet drew inspiration from one of his favourite Art Brut artists, Gaston Chaissac, who created similarly segmented, colorful paintings and sculptural figures. A comparison of Dubuffet's Personnage pour Washington Parade and Chaissac's Totem Double Face (1961) show extreme similarities, and in fact, Chaissac accused Dubuffet of plagiarism. (This was not the only case in which an artist made such an accusation of Dubuffet). It is important to note that many scholars, such as art historian Antonia Dapena-Tretter, do not consider Dubuffet to be an Art Brut or Outsider Artist (even though his work is, erroneously, most-often associated with these concepts). Although he drew inspiration from the Art Brut works that he collected, and was a strong advocate for Art Brut, his own art does not qualify as art brut as he himself defined the category. First, as he has stated, Art Brut artists "do not consider themselves to be artists and they do not designate their production as art," nor do they have any interest in exhibiting or receiving money from the sale of their artworks. However Dubuffet was very aware of himself as an artist, and worked hard to promote his work. Second, Dubuffet specified that Art Brut artists work without knowledge of the mainstream art world and do not have any formal arts education. However, Dubuffet was well-acquainted with the mainstream art world, and studied painting at the Académie Julian in Paris. Thus, by his own definition, he does not actually fit into the category. This birdhouse, painted with green and red plants, is a good example of a piece of folk art, an object created by an untrained working-class person with a primarily utilitarian and decorative purpose. However, while much folk art is created by unknown makers, we do know the "artist" of this work. Howard Finster was born in 1916 in Valley Head, Alabama as one of thirteen children. When he was three years old, he had a vision of recently deceased sister Abbie Rose who told him, "Howard, you're gonna be a man of visions." He grew up on his family's farm and stopped attending school after the sixth grade. When he was thirteen, he was "born again" at a Baptist revival, and three years later he began to preach at local churches. In 1940 he became a full-time pastor at Rock Bridge Baptist Church. He also picked up work as a bricklayer, carpenter, plumber, and bicycle and lawn mower repairman in order to support his wife, Pauline, and their five children. In 1965 he retired from preaching in order to work full-time on a visionary environment titled Paradise Garden in Pennville, Georgia, which he intended "to show all the wonderful things o' God's Creation, kinda like the Garden of Eden." In 1976 he had another vision. He recounts how "...one day I was workin' on a patch job on a bicycle, and I was rubbin' some white paint on that patch with this finger here, and I looked at the round tip o' my finger, and there was a human face on it... then a warm feelin' come over my body, and a voice spoke to me and said, 'Paint sacred art.' And I said to it, I said, 'I cain't do that. I know professionals can, but not me.' And it comes to me again and it says, 'How do you know?' I said, 'How do I know that I cain't paint.' I tuck a dollar out of my wallet, and I pasted it on a piece of plyboard and went out in front of my shop, and I started drawing George Washington off that dollar bill." Finster believed that God had asked him to create 5,000 sacred paintings, and by the time of his death in 2001, he had far exceeded this number. (A 1995 article in The New York Times noted that he was finishing up his 36,892nd piece of art.) His colorful paintings caught the attention of Athens, Georgia-based rock group R.E.M., who collaborated with Finster on the cover art for their second album Reckoning. He also participated in the 1984 Venice Biennale, as well as making appearances at folk music festivals and art schools around the United States. It is reported that he slept in his clothes and only took twenty-minute naps, in an effort to get out all his ideas. Judith Scott was an American with Down Syndrome, who was also deaf and never learned to speak. She lived in an institution from the age of 7 until 42, at which point her twin sister became her guardian. Two years later, Scott began attending the Creative Growth Art Center in Oakland, California. In the first two years of going to the center she showed almost no interest in art making. It wasn't until she attended a class by a visiting textile artist that she began to take a strong interest in artistic creation, which endured until her passing in 2005. Scott's instinctive, meditative, and so-called "obsessive" art practice involved wrapping found objects (such as coat hangers, office supplies, shopping carts, chairs, and whatever else she could get her hands on) in colored string, yarn, and fabric strips. Scott's sculptures took weeks, even months of methodical work to complete, and once finished, the spectacular cocoon-like creations completely concealed the hidden treasures inside. Over the course of eighteen years, she created over two hundred of these Trojan Horse-like sculptures, ranging in size from miniature to monolithic. Tom di Maria, director of Creative Growth, believes she was finally "learning to speak". Her early pieces thus acted as her first words after decades of severe isolation. Scott's sculptures act as powerful symbols of her experience. Yet they also appear to represent an effort on Scott's part to create a protective casing for items of value. In one instance, when assistants were moving her particularly large sculpture she had created, several tiny objects fell out of the work. It was then ascertained that the night before, Scott had secretly broken apart her necklace and put the beads inside her sculpture. Gregory Blackstock creates what cultural critic and writer Maria Popova calls "astonishing visual lists," and has what Roger Cardinal refers to as "obsessive interest in inventories and taxonomies". In this example of his work, he has produced diagrammatic grayscale illustrations of eighteen types of windmill, each neatly labeled underneath. Born in the United States in 1946, Blackstock was first diagnosed with paranoid schizophrenia, but the diagnosis was later changed to autistic savant. He obsessively reads encyclopedias, can speak a dozen languages, can play hundreds of songs on the accordion by memory, and can recall the names of nearly every one of his childhood schoolmates. Several of his drawings have been published in Blackstock's Collections: The Drawings of an Artistic Savant (2006). His taxonomic drawings range in subject matter from types of animals, plants, industrial tools, vehicles, buildings, stringed instruments, and mariners' knots. Within each drawing, each subtype of the category being studied (for instance, various types of crows of the world, American owls, or Italian roosters) are, as Cardinal describes, "diagrammatic, each item being presented plain and simple as the variant of a general type: thus, four dozen kinds of saw are squeezed into a single page, catering to a desire for symmetry as well as completeness." Thus, although Outsider Artists tend to be associated with fantastical imagery and imaginative scenarios, we see that there are some who produce realistic representations of objects and cityscapes with an astounding level of detail and verisimilitude.